Growing up in the southwest of the province, I know first-hand about all that Manitoba has to offer. I have spent much of my career attending and working at Brandon University and with the Nature Conservancy of Canada (NCC) in the field exploring this wonderful province. During the summer, more than 10 years ago, I had a chance to visit Churchill in the province’s far north. In the boreal tundra transition there, grass is replaced with a variety of wildflowers. Each week, I saw the landscape brighten with a new colour from different flowers in bloom. From the shoreline, I saw Hudson’s Bay shift from ice-covered to clear in a matter of weeks. Seeing beluga whales and seals from a zodiac along the river is a special treat I would definitely recommend! There are ridges by St. Lazare, in the province’s southwest, that slope down to Beaver Creek. From these forested ridges, I could see the valley along the Assiniboine River. This area is home to pristine sandhill prairies, which are only partially covered by vegetation, and well worth a trip to experience. The change in elevation is significant enough to hinder most satellite reception, as I found out while staying in a field house in the valley. Farther east along the Assiniboine River, I found myself descending a ridge down to the river on one of NCC’s properties. 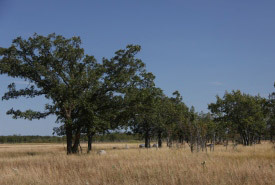 This ridge has a steeply sloping floodplain forest on one side, but the other side is open with some shrubs and an abundance of freshwater springs. Roundleaf monkeyflower, a rare plant, is found in these springs that run in small streams down to the river. 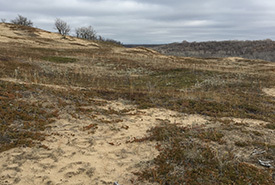 After visiting the river, I found myself scaling the steep ridge, I reached the mixed-grass prairie above. Arriving out of breath, I had the opportunity to pause and appreciate the abundance of flowering plants in the surrounding native prairie. 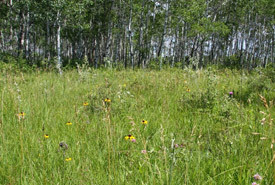 Mixed-grass prairie, with its unique native species that bloom in a variety of colours, supports rare and endangered species. Alvar and tall grass prairie are endangered ecosystems found in Manitoba. They host a variety of interesting and unique plants, animals, birds and insects. Alvars are found in the Interlake region between Lake Manitoba and Lake Winnipeg. Peering over the edge of limestone cliffs to glimpse a rare fern was enough to convince anyone, myself included, that Manitoba is not all flat. In all of Canada, the tall grass prairie is only found in southeastern Manitoba. Tall grass is not just a name; I can attest to the fact that big bluestem grass can grow taller than me. Rare orchids, butterflies and goldenrods are found in this area. Adjacent to Riding Mountain National Park, I spent many a day traipsing through forested hills, but I recall one day in particular as being most challenging. According to my health tracker, I hiked up 24 stories that day, so definitely not flat. 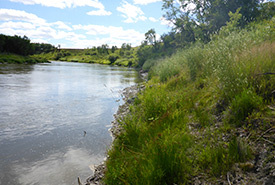 This past summer I completed a baseline inventory of a newly acquired property along the Manitoba-Saskatchewan border. I collected information about the plants and animals, natural- and human-caused features and the overall condition of the property. 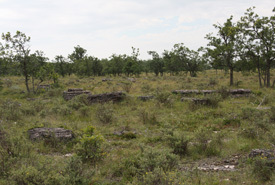 This prairie pothole region in the southwest is spotted with pothole wetlands that are used by a variety of wetland species. I saw many different waterfowl, wetland birds and even a moose that is known to frequent the area. I challenge anyone driving through Manitoba to get off the Trans-Canada Highway and explore the interesting and diverse landscape that the province offers. You can start by checking out NCC’s Nature Destination trails here. 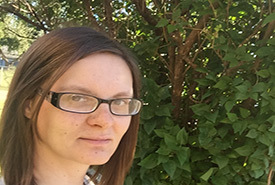 Ashley Greenley is the assistant conservation biologist for the Nature Conservancy of Canada’s (NCC) Manitoba region. Read more about Ashley Greenley.